Hives are welts (raised, itchy, red areas) that present on the skin. They begin as a reaction to certain medications, foods, and/or bug bites/stings. Seek immediate help and call 911 if the hives begin to spread to large areas or they begin to alter your breathing. While they can be dangerous, hives usually go away on their own in a few hours. They may persist for times lasting from months to years. To prevent hives, the best method is prevention. Keep an eye out for possible triggers. Make it a point to avoid them. Sometimes it is not possible to avoid your triggers. Then use over the counter antihistamines like Claritin or Allegra to help control the itching. If antihistamines are ineffective, a drug approved to treat chronic urticaria in 2014 may help. It is called omalizumab, and may be able to help treat instances of allergic asthma. Many oral antibiotics cause rashes as side effects. Amoxicillin, however, is usually the worst culprit. It is part of the penicillin family. This is the most common allergy producing medication. 10 percent of people are reported to be allergic to penicillin. That is usually overreported, however, as many patients mistakenly think they are having an allergic reaction to penicillin. In fact, it is only a common side effect, or reaction that happens to many people. afer using penicillin. There are two types of amoxicillin rashes, one that’s more commonly caused by an allergy and one that isn’t. Hives are itchy, raised bumps on the skin which can be white or red. Urticaria (hives) usually appear after takinh a dose dose or two of a medication, even one you may have taken in the past with no problems. This could mean you are allergic to penicillin. Call your podiatrist right away, beacause your allergic reaction may worsen. Stop taking the medication immediately. If your lips or throat begin to swell, call 911 immediately or visit your local emergency room especially if you experience difficulty in breathing. Another type of rash which appears later than hives and looks different, is the maculopapular rash. Flat, red patches appear on the skin3-10 days after iniyiating Amoxicillin oral antibiotics. Thes are smaller and a slightly lighter red color of patch. 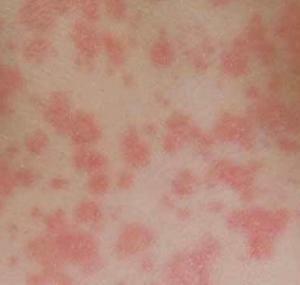 This type of rash often develops between 3 and 10 days after starting amoxicillin. It could , however, start at any point after taking the antibiotic. The hives urticaria can spread to a persons entire body, chest, arms and legs being very common. Allergic reactions cause the hives urticaria, but most doctors aren’t sure of the causes the development of maculopapular rashes. Skin rashes don’t necessarily mean you have an allergy to pcn either. It is usually a common reaction rather than true allergy to the medication. This reaction goes back to the 60’s where a lot of people were told by their parents that they are allergic to penicillin when they really aren’t. The rash was reported in 80 to 100 percent of children taking Amoxicillin. Follow package instructions for over-the-counter Benadrylas your initial response. No further doses of Penicillin should be given. Call your Doctor or Podiatrist. Benedryl also helps with the itching that often accompanies the rash. Monitor oyurself or your child for trouble breathing or lip or throat swelling. Rashes usually disappear by itself if you discontinue medication. Then it can clear from the body. Itchiness responds to steroid creams applied on the skin.